You Can’t Have Cigars Without Fire. 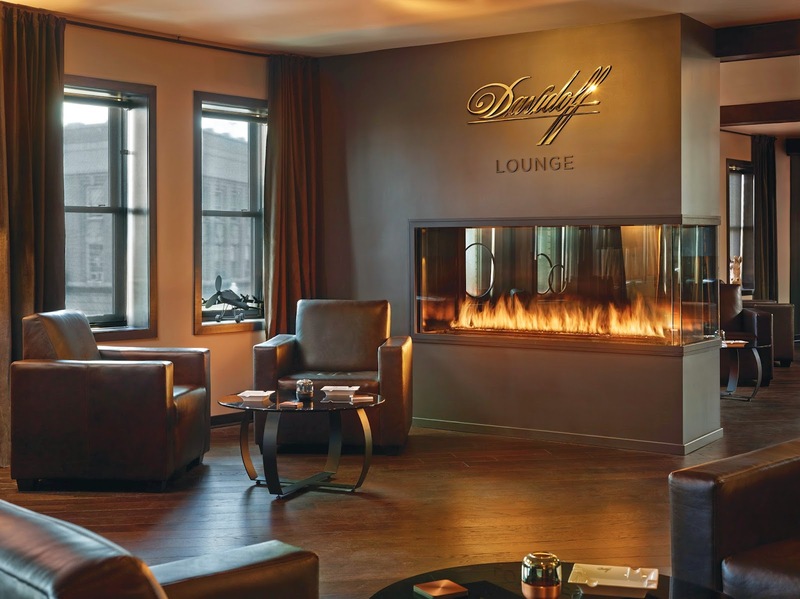 Acucraft Fireplaces created this gorgeous Custom Peninsula Gas Fireplace for the new Davidoff Cigar lounge in Ridgewood, NJ. This fireplace was designed with side viewing of 78″ wide x 30″ tall, the front viewing area is 28″ wide x 30″ tall. Custom Heat Relief System which was designed to provide heat to the room when the thermostat called for heat, and expelled the heat outside when the room did not need additional heat. This was done by an auto damper wired directly to the Honeywell thermostat. The space was equipped with heavy ventilation by the customer to ensure up to 20 guests could enjoy their cigars without lingering smoke and enjoy a comfortable temperature. This fireplace’s output is up to 85,000 BTU depending on the desired height of the flame, and is easily controlled through an on/off wall switch. To the left is the initial rendering provided by Sia Saint-Pierre, Davidoff of Geneva – Norwalk, CT. The photos below & to the right showcase one of the testing phases done by Acucraft with all of our fireplaces to ensure we capture the type of flame requested by the client. You can see how the burner produces tall lazy flames. Acucraft’s patent-pending glass cooling system is the go-to option for many of our clients. This system forces cooler air from outside into the air channel between glass panes to keep the average glass temperature to 145 degrees Fahrenheit. The image below diagrams how our glass cooling system works. The blue arrows represent the glass cooling intake air which is taken from outside, passes between the glass panes keeping them at a touchable temperature but warming that cool air up which can then be transferred back into the space or vented outside (orange arrows). The yellow arrows represent the combustion air intake which takes air from outside, flows through the fireplace, heats up, and creates a draft which pushes the vented gas to the outside (red arrows). These two systems work together to maintain a safer, cooler glass temperature as well as providing you with optional additional heat to your space.